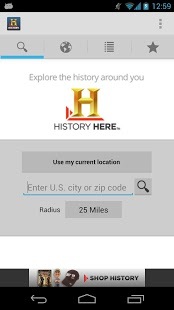 HISTORY Here is an interactive guide to thousands of historic locations across the United States, brought to you by HISTORY. 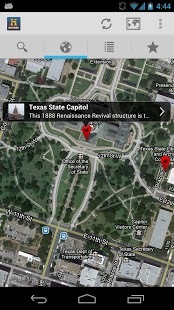 The easy-to-use interface, photos, video and dynamic maps bring history to life anywhere in the country. 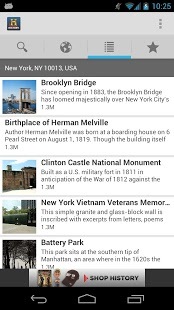 Whether you're on vacation or just running errands, the app makes it simple and fun to get the facts on the history hidden all around you, including amazing architecture, museums, battlefields, monuments, famous homes and much more! ***WE ARE ADDING MORE POINTS OF INTEREST ALL THE TIME. We love feedback -- please email us at mobilesupport@aetn.com to suggest areas that need more coverage. * Thousands of exclusive points of interest, written by the history experts at HISTORY. * Select your current location with GPS or choose any location across the country. 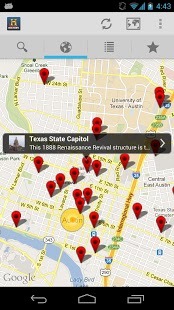 * Customize your search to see historic points of interest—from right next door to 100 miles away. 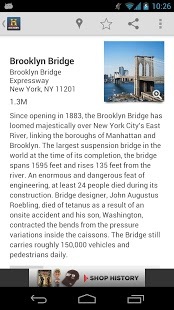 * View images and stream HISTORY video directly within the app.